with Reserved Font Name Tehuti. Update 07/22/2017, version 1.2. I’ve added a couple more glyphs to the bold version, and corrected a character in Latin Extended-E.
Update 05/28/2017, version 1.2. I’ve added a couple more glyphs to the bold version, and created some alternate-spaced versions for ebooks or general usage (Dehuti Alt Book, et cetera). Note: The spacing is normally set high to accommodate diacritic usage and avoid overlapping and clipping. Update 04/19/2017, version 1.2. I’ve corrected an arrow that was facing the wrong direction, and adjusted the weights for the bold versions, as they had been set for regular. Thank you for the input. Update 04/16/2017, version 1.2. I’ve altered a couple of the combining diacritics, removed some repeated glyphs, and added some more arrows to the bold version. Update 04/04/2017, version 1.2. I’ve added a few more arrows in the bold version, and corrected and added some more math symbols. Update 03/23/2017, version 1.2. I’ve added polytonic Greek, plus the remaining punctuation for it, and relocated the mid-stroked Ks to A72C & A72D, as this is an alternate design for the Cuatrillo. The same applies to the mid-stroked Qs being an alternate for the Tresillo. I’ve moved ezh with palatal hook, i.e., F235, to 0293, slightly tweaked the bold X’s, added a few new characters, such as an alternate exclamation mark for math (2757), and an alternate logical not sign and obelus/divide sign in the bold versions, i.e., 00AB and 00F7, for use as dashes in Russian, Polish, et cetera. I’ve also redrawn and added the majority of math symbols, APL, arrows, and geometric shapes. Update 10/17/2016, version 1.1. I’ve fixed some of the curves in a few characters that I missed while enlarging the font in early September. I’ve slightly altered a couple of the Cyrillic glyphs, some math glyphs that were offset, updated and added more currency symbols, relocated some glyphs, plus added some new glyphs, combining diacritics, and punctuation as per the latest version of Unicode. Dehuti /de.ˈhjuː.tiː/, formerly Tehuti, is a modern font predominantly based off Dwiggins’ Electra, with touches from Palatino, Fairfield, and Goudy old style. Overall, Dehuti became what I had tried to achieve with Tehuti, i.e., a font that supports Amerindian and African languages, and one that is harmonized in all aspects. I did this because of my interest in linguistics, because there are so few fonts that support such languages, and because the ones that do aren’t entirely harmonized in their design. All extra features, including alternate characters, et cetera, are available via open type tables, or, for those programs without access to open type, are in the Private Use Area at the end of the font. 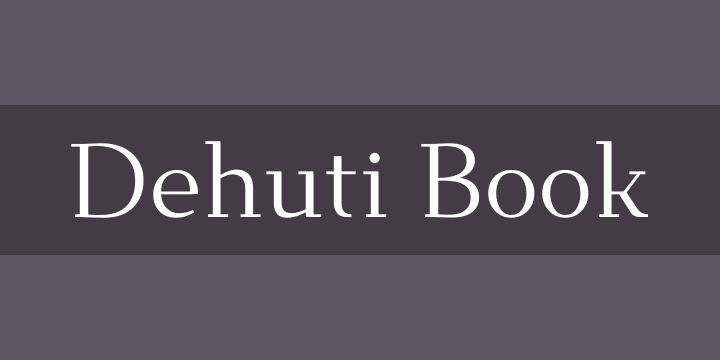 Since Dehuti is a Unicode font, I will update it on occasion, so check back for newer versions. Notes: 1) The modifier letters are set at the optimal height for text; they are not superiors, but numerators, meaning that if you need to add additional letters to text use the numerator table, i.e., for abbreviations as in 5th, 1ère, and so on. The standard superiors are set for math. 2) The bold versions of the font have some alternate/reversed characters; I did this because there is no difference in the math or punctuation symbols, i.e., the bold versions are not actually bold, which gives the font a better harmony. 3) The font uses anchors, which means that it will not align properly for linguistic use, or otherwise, without open type. 4) For those interested, Open or Libre Office can access all glyphs using: Insert > Special Character. 5) A font log (Dfl.txt) is included that lists the extra characters in the PUA. • Extended punctuation. For the uppercase middle dot, use (2E31). I placed the Teuthonista double bar on (2E3F). For those unfamiliar with the “reversed” question mark (2E2E), it is used for ironic statements. • Redesigned glottal stops. Their new design resembles curved 7s, i.e., they lack the stem, which is preferred in the languages that use them, and are also set at lowercase height. If you need to use cased versions, those are (0241 & 0242), and (01B8 & 01B9) for the voiced pharyngeal fricatives, i.e., the reversed Ezhes, which originally represented these sounds anyway. • SIL additions, which start at F1A1: 1) Nine-step tone markers for African orthographies (F1F1-F1F9); 2) Retroflex D with hook (F20D), counterpart to (1D91); 3) Z with palatal hook (F234), counterpart to (1D8E); and, 4) a & A for Kaolib (F247 & F248). • Small mathematical operators that correlate with vector or cross product (2A2F), plus fullwidth mathematical operators that correlate with multiplication X (2715). Note: The fullwidth tilde in the Book version is intended for math. This character, in the other versions of the font, is the same as 301C (wave dash). • Extra script, fraktur and double-struck letters, as well as raised MC and MD, and more pictographs.